Multi-wheel roulette - what is it and how can I play online? Multi-wheel roulette is a variant of online roulette that allows you to play multiple roulette games in the same window at the same time. We explain more about the multi-wheel roulette format and where you can play these online games for real money bets at the safest casinos on the Web. 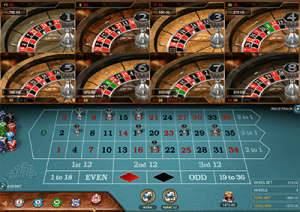 Multi-wheel roulette follows the standard rules and format of European roulette, but instead of playing one game, you can spin up to eight roulette wheels at once. There’s only one betting table, so the bet you place applies to all roulette wheels, stacking the odds in your favour. Playing multi-wheel roulette gives you the chance to win big several times with every bet. However, as the bet you place applies to all active games, you’re essentially betting eight times as much as you would when playing a single game. This means you can burn through your bankroll pretty quickly, so you should always set yourself limits before getting stuck into multi-wheel roulette and ensure you bet within your limits. The most popular multi-wheel roulette game you’ll find online is Microgaming’s Multi-Wheel Roulette Gold. This game is available for instant-play directly over your Web browser using Flash, or by downloading premium casino software if offered by the venue. Sign up with one of the recommended online casinos recommended on our site. Make a real money deposit in your local currency using a trusted payment method like Visa, MasterCard, Skrill, Neteller, Flexepin or Paysafecard, while taking advantage of any new player welcome bonuses as you go. Load Mutli-Wheel Roulette Gold directly over your Web browser. Click the betting chip of your desired value and place it on the corresponding place on the betting table. Note that this bet will apply to each and every one of the active roulette wheels, so if you bet $1 on red, your total bet will be $8.00 once applied to each game. You don’t have to play the maximum of eight games, and can de-activate any of the roulette wheels by clicking on the ones you want to disable. When your chosen bets are in place, click the spin button to start the game and watch as the multiple roulette wheels start spinning at once. When the wheels stop spinning, markers will be placed on the betting table to signify the winning numbers from each game, with all winning bets automatically credited to your account. Multi-Wheel Roulette requires no special skill or strategy to play, and it’s suitable for beginners and experienced roulette players. It’s a luck based game, so your chances of winning are the same whether this is the first time you’ve played roulette or the hundredth. If you’re not sure if the multi-wheel format is right for you, you can try it online for free in practice mode first before deciding if it’s worth your hard-earned money. Microgaming is one of the world’s biggest and most trusted names when it comes to casino software, and as such you’ll find Microgaming titles, including Multi-Wheel Roulette Gold, at many of our recommended online casinos. This is the only multi-wheel variant we’re familiar with, however you’ll also find a heap of other single-wheel roulette variants at our recommended casinos, including European Roulette, American Roulette, French Roulette and more. When playing at a casino recommended by BettingPlanet.com, you can rest assured you’re playing at a safe and reputable venue that’s undergone our stringent testing policies before receiving our seal of approval. Our recommended casinos are all legally licensed by the world’s leading gambling jurisdictions, offering certified RNG (random number generator) software with all financial transactions protected by a minimum of 128 Bit SSL (Secure Socket Layer) digital encryption security. If you’re looking for fast paced, action packed gameplay that offers the chance for some huge wins, multi-wheel roulette will be right up your alley. With eight wheels spinning at once, it’s eight times the risk but with a potential eight times the rewards. Due to its high-risk nature, multi-wheel roulette is best suited to seasoned roulette players who are familiar with the game and have enough money to risk playing up to eight games at once. Beginners or those with smaller bankrolls are better off sticking with a classic version of European Roulette, which isn’t as overwhelming and allows you to be more diligent about your bankroll. But adrenaline junkies, this one’s certainly for you! Can I play live dealer multi-wheel roulette? Unfortunately, no software developer currently offers a multi-wheel live dealer roulette title, but there are plenty of other live dealer roulette games available to keep you entertained. Software studios like Evolution Gaming and Ezugi offer some fabulous interactive roulette games hosted by attractive dealers from sophisticated roulette studios, including Live Immersive Roulette, Double Ball Roulette Live, VIP Live Roulette and many others, which can be found at our recommended casinos. Multi-Wheel Roulette can be found at several of our recommended online casinos, catering to players from all over the world and offering exclusive welcome bonuses to players who sign up using the links on our page.